​+011-506-8308-8745 (cell) and +011-506- 2743-8115 (office), https://www.pacificexpeditionscr.com/. Ask for Karol who is bi-lingual and mention you are a Jaguar Property Management guest to receive our corporate discounts. They will provide you with all the necessary information, and assist you in booking. Be sure to contact them well in advance of your arrival, especially if coming during high season. On the road between Dominical and San Isidro. Nauyaca Waterfalls is a totally Costa Rican owned family tourism company. Horseback riding tours travel through the farm that borders two impressive waterfalls from Río Barucito, with a stop for lunch. Swim and hike around the falls. The horseback tour starts at 8:00 a.m. and finishes around 1:30 or 2:00pm, the tour cost is $60 dollars per person and includes: guide, horse, breakfast, lunch and the admission ticket. Bring: Sunblock, towel, long pants, bathing suit and walking shoes. They are located 10 km from Dominical beach, on the road to San Isidro del General, after Dominicals big bridge and the Police Station turn right. There is a sign on your right side that says: "Don Lulo´s Nauyaca Waterfalls". http://www.cataratasnauyaca.com/ 2787-0541. Rustic little touristy surfer town about 20 minutes north of Uvita. Best day to go is Saturday/Sunday, since the beachside vendors are there on the weekend. Have lunch at the beachfront bar/grill Tortilla Flats, hang at the beach all afternoon, go surfing (or watch the surfers), peruse the little shops along the main drag and beachside vendors. Beachfront massage is available. Farmers Market in Uvita located at the covered soccer field on Saturday (50 meters west of Banco de Costa Rica). 8am - noon. Come early for baked goods, vegetables, jewelry, photographic art, Baruca Masks, fresh fish, pickles, jams, etc. Have lunch or a smoothie at the Roadshack Deli/Restaurant across the street. 30 minutes south of Uvita, consists of a network of cables strung from one tower to another high above the jungle floor. Riders travel along the wire via a specially-designed harness that is safe and secure. Kayaking and Stand Up Paddle Boarding offers you a chance to view amazing beauty and nature that you can’t see from land. Whether it’s high adrenaline on the ocean, or slowly paddling up the river, we have a tours for all levels and ages. We can also book other tours located in Dominical. All Tours Include Safe Parking, Park Entrances, Certified Guides, HUGE fruit display of the most amazing tropical fruit and ice cold water. Airborne Arts who has begun offering day tours for High Flying Trapeze, Aerial Silks and Acrobatic Balancing. Classes are $75 per person. Classes can be booked Monday through Thursday. Hacienda Barú National Wildlife Refuge & Lodge is situated on Costa Rica’s Southern Pacific Coast. This is a region of distinct natural beauty where forest covered mountains rise up from the dramatic Pacific coastline. Hacienda Barú’s 330 hectares (815 acres) have a fantastic variety of Habitats, from wetlands and secondary rainforests in the lowlands to primary rainforest on the highland coastal ridge. Seven kilometers of walking trails and three kilometers of pristine beach are here to be explored as well as our orchid garden and butterfly garden. Bird Watching, Canopy Exploration and Ecological Tours are our specialty. Our bilingual grass roots naturalist guides will help you discover the wonders of the tropical rainforest, such as leaf cutter ants, the sleepy sloths and the nesting site of the Common Pootoo. On our tours you can experience everything from the Rainforest Canopy to Mangrove Swamps or the Jungle at Night. Our Mission is to protect the wildlife habitats of Hacienda Barú, while educating our visitors about its biological wealth. Learn more about the history of Hacienda Baru’s evolution from a working cattle ranch to a National Wildlife Refuge & Lodge. 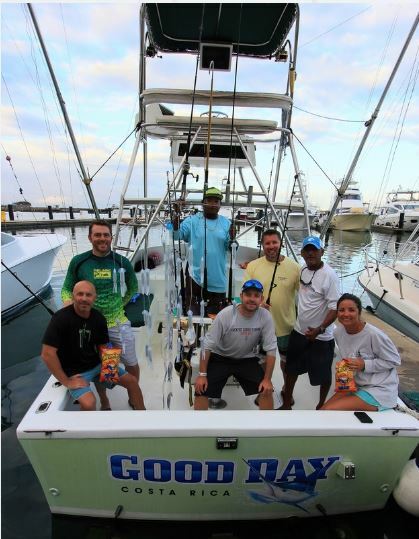 Jackpot Sport Fishing - Inshore and offshore with Benn Gilmour. Bilingual, extremely knowledgeable, friendly and accomodating, whatever your target fish, Benn makes it happen! Let them know Jaguar Property Management sent you to get your discount! Be sure to specify in advance if you are looking for big bill fish (catch and release) or tuna/maki/pargo (dinner). We have two groups of humpback whales migrating here to give birth each year off our coast (because there are fewer predators, like killer whales, here). Those from the Southern Ocean / Antarctica arrive here first (August thru early September). Whales from southern California / Baja Mexico come here for about the same time period during December. Alaskan humpies go to Hawaii for the same purpose.) The day of arrival and departure is variable. Welcome to Paragliding, the purest form of flight that exists in aviation today. With just a few steps we launch into the sky and go up while gliding with native birds. Watch clouds form around us as we gracefully soar the rising currents of air. The joy of flight will be a lifetime memory. Whether you're a beginner, novice or expert pilot, we've got the gear you need to take on the "big air". Check out our classes, and learn from a USHPA certified Advanced Instructor. Individual instruction available, whatever your skill level or rating. Hawk Adventures is a full service school including equipment, sales, service and reserve repacks. Tour a local coffee plantation owned and operated by Don Emilio's family since the early 1900's. Learn the process, enjoy a wonderful cup of coffee harvested and prepared by Don Emilio and his family. Kayak rentals and guided tours to and through the Ventanas ocean cliffs and caves. Snorkel Marino Ballena National Park and discover many varieties of tropical fish, coral and colorful sea life at Ballena Island. Take a tour through the mangrove swamps for bird, flora, and fauna viewing and photography. Or, take a calm and relaxing paddle up the mouth of the Terraba River; explore Garza Island. Contact Fred or Jamison at 506-2786-5228. The 22,000-hectare Térraba-Sierpe Wetland Reserve is a vast network of mangrove swamps fed by the waters of the Ríos Térraba (to the north) and Sierpe (to the south), which near the sea form an intricate lacework of channels and tidal esteros (estuaries) punctuated by islets anchored by manglares (mangroves). The delta, which extends along 40 kilometers of shoreline, is home to crocodiles, caimans, and myriad birds. The indigenous Costa Rican tribe Boruca (also called Brunka or Brunca) is known for its vibrant, intricately carved and painted masks. But behind the mask is a community built on rich and unequalled customs, foods, festivals, traditions and more. Daily life in Boruca reflects a self-sustaining agricultural village, but one where the majority of the economy is supported by artisan crafts and ecotourism. Discover the aspects of Boruca culture including religion, food, medicine and education along with the people themselves. Alturas Wildlife Sanctuary is dedicated to providing a safe haven for injured and orphaned wildlife to rehabilitate for return to the wild or to live out the remainder of their life. The sanctuary is open to the public for education and up close experience with the sanctuaries animals. The primary goal is to raise awareness of the fragile ecosystems that are threatened by encroachment into their habitat. Visitors to the sanctuary will have the chance to observe and learn about primates and other animals up close during their visit. You can join as a day visitor or as a short or long term volunteer/intern Sadly mostly due to the problems caused by man, Animal Rescue Centers have become an important part of protecting animals and there natural habitat. Hunters, illegal exotic animal exporters, roads, electrical lines and people inappropriately keeping wild animals as pets; all end up hurting and injuring wild animals. That is where this animal rescue center comes in, to nurse injured animals back to health, hopefully releasing them in the wild. Some of their other animals were inappropriately held as pets, or are injured to the point that they can not survive in the wild. Volunteers, Veterinary Interns, Zoologists and Biologists, all play an important role in the health, rehabilitation and conservation of the wild animals here at the Alturas Wildlife Sanctuary. Eco volunteers and interns will be helping with activities relating to the management of this wildlife center. Some of your experiences will include feeding, behavior observations, building cages, maintenance, care and general health of the animals; as well as activities relating to the possible reintroduction of animals back into the wild. Cosa Rica is widely considered to posses the highest density of biodiversity of any country in the world. It is an extremely tiny country but boasts a wide range of habitats, and a wealth of species from both North and South America. Costa Rica is home to nearly 500.000 species; of these, there are nearly 250 species of mammals, 1250 species of Butterflies, 894 bird species and much more. This Wild Animal Rescue Center is located on the grounds adjacent to Villas Alturas, in Southern Costa Rica, 7 kilometers south of Dominical. Open Monday-Sunday 9:00 am - 4:30 pm. A bit more of an undertaking (time and money-wise), probably eating up 2-5 days. The park is very, very remote and requires and 8 -10 hour hike into the ranger station from the nearest place to park a vehicle. Boat rides or puddle jumper flights can bring you to Sirena Station also if the hike in isn't your thing. The best thing to do is find lodging (such as www.casitacorcovado.com with Jamie and Craig) and have the operator arrange for your tours and provide info. You can drive to Drake Bay if the weather has been dry enough for the roads to remain passable, figure on a 3.5 - 4 hour drive from Uvita. If the roads are not passable, you can take a same-day boat shuttle from Sierpe to Drake Bay and back again. To get to Sierpe, head south past Palmar Norte, turn right headed south on the PanAm Highway toward Panama. Right after the large bridge, you will take your first right. This will take you thru Palmar Sur. Continue for about 15 minutes until you get to Sierpe. When you get into Sierpe, there will be a park on the left hand side. Pass the park, take a left at the end of the park. You will run directly into Restaurante Las Vegas. Park your car in front of the restaurant. Go in and go up to the bar. Ask for Don Jorge. He is the owner, a short Colombian in a white cook's jacket. Tell him where you are staying and that you want to park your car overnight. He will show you your captain, and take your keys to park your car. It should cost $6 per night for secured parking. Boats leave Sierpe to Drake Bay at 11:30am and 3:15pm from Restaurant Vegas and Oleaje Sereno. The boat will bring you to Drake Bay, about a one hour boat ride away. The reservations can be made by your lodging operators. Returning boats leave from Drake Bay back to Sierpe at 7:15am and 2:30pm. There are several Ranger Stations in the park, the one with the most opportunity to see wildlife is the Sirena Ranger Station. If you do not wish to hike from Drake Bay into Sirena Ranger Station you can take a boat transfer for $45/person or $250 per boat, the ride takes about 1 1/2 hours. As of February 1st 2013, the Corcovado National Park Manager limits the number of visitors each day, so it is necessary to pay the entrance fee in advance. There is no bank or ATM in Drake, so bring some cash. Corcovado National Park is primeval Costa Rica, tons of wildlife and very very remote. There are very few roads in, and very few people. Access beyond Sierpe can be non-existent during the rainy season. Lodging is available at outlying hotels, and you can bunk or tent camp at the lodge/ranger station for a night. Bring your backpack; rubber boots, flashlight, flipflops, bottled water, Off bug-spray, light colored t-shirts, nylon quick drying shorts, 1 pair of flip-flops, one pair of walking shoes that can get wet and dry easily (no leather), water socks/shoes, a light plastic poncho, sheets for the beds (if you are camping at Sirena Ranger Station). Costs are; $15-20 boat shuttle to/from Sierpe/Drake Bay, lodging/camping ($ varies), boat shuttle from Drake Bay to Sirena $45, Sirena private guided tour $90, Night Tour w/ Tracie $35. You can contact us for a list of Drake Bay lodging operators.